Equipped with vacuum suction kick feeding system, ensure curved board can be fed smoothly, and also with air adjusting volume function. Heavy duty Cast Steel feeding tracks for smooth functioning of kick feed system. The Print Units are detachable with motorized movement. The print running register is controlled by 360 degree circumferential movement on Push Button. Plate mounting system on the print cylinders with one sided ratchet grip for holding the plate. Plate thickness upto 4mm. The pressure adjustment of Anilox & Rubber roller is controlled manually on adjustment worm gear box. Precise Anilox and rubber roller with micro adjustment of pressure to ensure good quality printing. 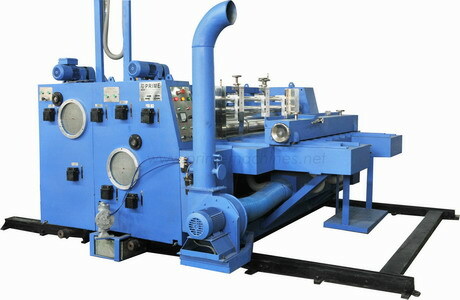 Rubber Roller with AUTO IDLE system to prevent ink from drying on the roller when the machine is stopped. The Ink circulation system is automatic for a consistent viscosity of ink, by using diaphragm air pumps. The Upper Slotter roller has a 360 degree circumferential movement for running register control operated by push button. 4 sets of Slotting Heads and 4 sets of Creasing Heads. SHIFTING of upper and lower slotting heads along with creasing heads is done by push button. Slot Depth/ Box Height setting on all the slotting heads is done in a single operation with the help of the adjustment shaft passing through each slotting head. Side Trim/ slot scrap removing belt with inline folder gluer machine.